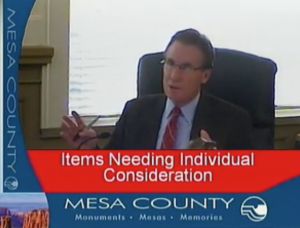 In a jaw-dropping political turnabout at Monday’s (2/8/16) Mesa County Commissioner meeting, the county’s farthest ultra-right wing nuts out-right winged the regular right wing nuts, resulting in arch conservative Commissioner Scott Mcinnis strongly defending — yes, defending — all the good the federal government does for Mesa County citizens and our quality of life. The fireworks started with a discussion of whether Mesa County should accept a $2.1 million grant to build a detention pond in Bosley Wash at the bottom of the Bookcliffs. The wash has been the site of several flash floods in recent years resulting one person getting killed, several private properties being repeatedly covered in mud and silt and massive mudflows pouring over I-70. Bosley Wash endangers a total of 200 properties near the base of the Bookcliffs between Clifton and Palisade. Several persuasive public servants spoke in favor of the project. One was Mesa County Emergency Manager Andrew Martsoff, who pointed to the loss of life and property due to flooding in the wash, and urged the Commissioners to accept the federal funds for the retention pond project. Another was Kristin Winn, a former public information coordinator for the City of Grand Junction, who was present in person at Bosely Wash the day the flood death occurred. 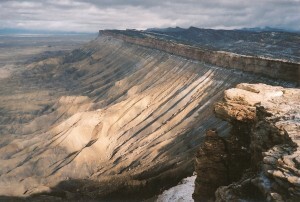 Winn said a hard summer rain storm over the Bookcliffs generated a flash flood in Bosley Wash at the bottom of the Bookcliffs that crossed I-70 and caught an unsuspecting elderly couple as they drove on the highway. The rushing water flipped their car over and the couple got caught inside, upside down with their seat belts on, in the rushing flood waters and mud flow. The driver, an 84 year old man, was killed. His 86 year old wife survived. “If we can prevent any kinds of deaths from flash flooding,” that is the role of government,” Wynn told the commissioners. She urged them to take money to make the Bosley wash area safer. King then started to step away from the podium when Commissioner Mcinnis called him back. Mr. McInnis’ harsh rebuke highlighted the callousness and even folly of the ultra-pure ideological right wing viewpoint, explaining what is wrong with it at it’s core: it means a few people get to pick who lives and who dies, who gets medical help and who doesn’t, whose property and vehicles merit protection and who must be left to their own devices, and in many cases who eats and who starves. It was a very rare and refreshing moment in which a typical Mesa County Republican right wing nut elected official publicly praised all the good the federal government does to enhance citizens’ quality of life, and pointed out how we all benefit from the federal government’s largesse — even the most government-hating, ideologically pure wacko right wing nuts, like Kevin King. Thank you, Commissioner McInnis, for reminding Mesa County citizens about the quality of life we all enjoy here in the Grand Valley, thanks in large part to our federal government. And thanks, too, for finally giving Mesa County’s hardened, harsh right wingers, like Kevin King, a reality to think about. Sadly one sided and willfully aggressive and insulting. Can’t believe a word with diatribe such as this. Unbelievable, mcGinis sticking up for the public! I agree with your analysis of the exchange but, why must you resort to childish name calling? You demean yourself and your position by such childish behavior. I just found Ann’s place and find her to be one of the better writers that I link to and the best Colorado local blog I have come across. Any rebuttal to idiocy like this man espouses is fair game. Forgive me, Rob. At the risk of alienating you, I do think that when a personal ideology includes crass indifference to human life, I think that crosses a line into being nuts. I agree. It is so ugly to read such childish attacks. Personally I believe that life and preservation can be much better without the federal government. So, after a long career in politics, Scott finally met someone that sounds to him, like he sounds to logical people. I sat through this tirade from McInnis aimed at King’s desperate attempt to vilify the grant money and its acceptance by the Commissioners. I was actually proud of McInnis. He stated the issue clearly and succinctly enough that Kevin may actually rethink how he approaches these issues. On the other hand, Kevin does do good work. He researched Steve King’s salary issue, he researched our present sheriff, Matt Lewis’ involvement in a 4th Amendment incursion and the liability costs of that. Scott and Kevin had a good public interaction, and there is nothing wrong with that. Personally sick of the name calling and demonization of people. Thanks Anne, this was very informative. Ann, you’re so awesome for reporting on commissioners. Having sat through my share of government meetings, I realize it’s torturous, but this meeting sounded particularly flavorful. Thanks for doing your work. I, too am pleasantly surprised with McKinnis’s words. I live in this flood zone so this holding pond would be greatly beneficial to the agriculture south of the area. Our high water table here woulld be impacted (beneficially) with this project. I am still picking my jaw up off the floor, and I have to type words I didn’t think I would ever type in the same sentence. Thank you Scott McGinnis! Same here. I was blown away. I agree with Scotty that the project needs to be built, but I also have to ask how much are to Kochs, and contractors paying him, as well as other commissioner for there no bid contract to build it? And then there’s the question is it going to be named after Scotty after it is complete? The “McInnis National Flood Control Area”? Hmmm…has kind of a ring to it, doesn’t it? I did a double take here. Pretty interesting. I actually checked to see if it was THAT Scott Mcinnis.